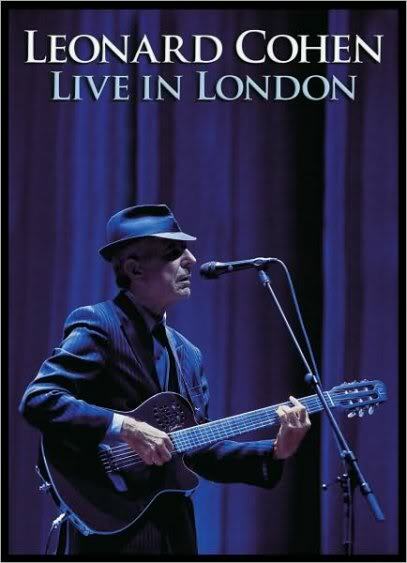 Before Leonard Cohen embarked on his current world tour — which is now winding its way through the United States and Canada — few, if any, could have predicted the septuagenarian would deliver a nearly three-hour, multiple-encore performance for all of his headlining dates. That the tour would be so well received proved — if not at first to Cohen, then certainly to his devoted fans — far less surprising. Recorded on July 17, 2008 at the O2 Arena in the United Kingdom, Live in London (released this week as a 2CD set as well as on DVD) finds Cohen in unassuming command of his audience while paying unselfish deference toward his songs. In serving the character and enduring distinction of his works — from early ruminations like “Hey, That’s No Way To Say Goodbye” and “Bird On The Wire” to latter-day prophesies like “Democracy” and “The Future” — Cohen enlivens them on the stage, revisiting his acute perceptions of the human psyche and soul. Considering the dreary complexion that has long beset his canon and reputation, it’s striking (and refreshing) to behold Cohen in such good spirits as he is here, injecting some self-deprecating humor between songs or, better yet, within them. The audience often chokes up in laughter when he sings particular lines, many written decades ago — like “Well my friends are gone and my hair is grey/ I ache in the places where I used to play,” from “Tower of Song” — as if only then had everyone gotten the joke that was originally intended. All the more remarkable, though, is what hasn’t changed, particularly that the setlists haven’t varied considerably over the extensive arc of this tour; Cohen’s banter between songs hasn’t even deviated all that much either. And yet, for those who’ve taken in a show, even for those who’ve taken in multiple shows — witnessing Leonard Cohen summoning these timeless, treasured songs to fresh life — each concert feels altogether exhilarant and genuine. For those, including this writer, who have attended a performance during this singular and epic concert tour, Live in London serves as a befitting and thoroughly enjoyable souvenir. For those who haven’t but who appreciate Cohen’s music nonetheless, both the audio and visual presentations make for outstanding live documents.